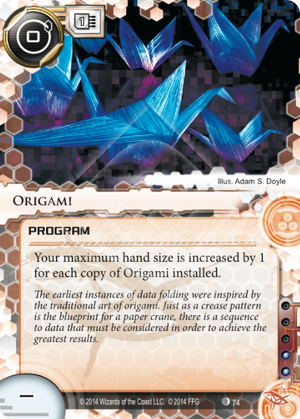 Your maximum hand size is increased by 1 for each copy of Origami installed. The earliest instances of data folding were inspired by the traditional art of origami. Just as a crease pattern is the blueprint of a paper crane, there is a sequence to data that must be considered in order to achieve the greatest result.